Do you have arm flab? Get Toned Arms! You might be surprised on how many guys complain about that little bit of extra fat on the back of the arms – women like to call them batwings. Fat can accumulate underneath your arms and these batwings can be embarrassing for the guys. There is no arguing that arms are the ultimate barometer of bluffness. They immediately let people know that your fit. All the dieting and exercise just may not be enough. Luckily, we have our medical provider and Noydeen Beauty at our side. Our medical provider understands that we all have pockets of stubborn fat and that his clients are searching for treatments that are safe, non-invasive and permanently kills fat. At Noydeen Beauty, we use SculpSure laser technology to destroy arm flab. SculpSure works by causing fat cells to die from exposure to the laser energy that creates heat. If the your arms have a moderate layer of excess fat, SculpSure works well to eliminate those fat pockets. The laser is state of the art, non-invasive fat removal and a fat killer. With one or two rounds of treatment, you’ll about a 24% reduction of fat in the treated area. SculpSure can be used for the treatment of arm fat as well as many other areas. Using diode laser technology, SculpSure obliterates the fat under the skin. The laser energy is transmitted through the skin and then absorbed by the fatty tissue which is the main target. In doing so, the energy is absorbed by the visceral, fatty layer by heat which in turn destroys the fat cells. It’s an outstanding laser that can be customized to each body type to deliver great results. At Noydeen Beauty, our medical provider works closely with his patients to get great results and deliver patient satisfaction. 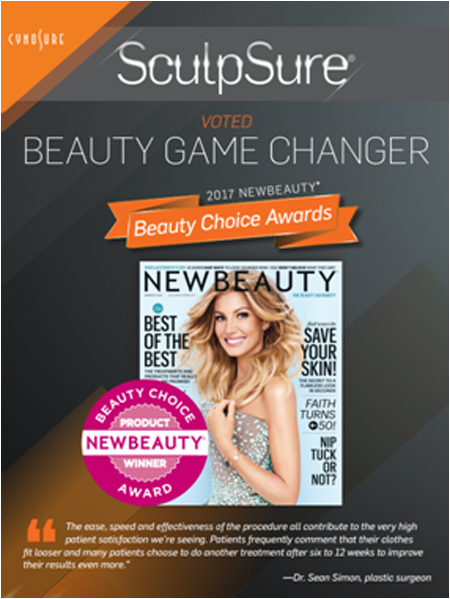 The SculpSure™ device is a laser. The laser light is shined on the skin for approximately 25 minutes. During this time the laser light heats the underlying fat and initiates a process that leads to the loss of fat cells. Results become visible over the next 2 to 3 months. In order to maintain symmetry, most patients will have their right and left sides treated on the same day. One of the many advantages of the SculpSure™ procedure is that the two sides can be treated simultaneously and the entire treatment completed in approximately 25 minutes. Patients may do whatever they wish during this time, including reading, working with their electronic devices, or listening to music. The SculpSure™ treatment results in a reduction of fat in the treated areas. Results look quite natural, and patients are able to achieve their results without any downtime and without surgery. The treatment is extremely safe. Patients are able to resume their activities immediately after leaving the office, including returning to work and exercise programs. If desired, the treatment can also be repeated in 2-3 months to further enhance the result. If you have stubborn areas of fat that you can’t get rid of, SculpSure™ is the revolutionary treatment that you’ve been looking for. In addition to its FDA-approval for safety and effectiveness, it also requires only one treatment in most cases to see results, whereas several other fat reduction techniques require multiple treatments. You don’t have to fear any pain or discomfort, and you can return to work and all other activities right after your SculpSure™ session.